Texas Tigers: My first Stitch Fix - help me decide! So I'm sure by now you've caught on to the theme of all these subscriptions services popping up everywhere. Most of them I've been iffy about. Would I really want the things in the box? Or would it be a waste of my money some months? 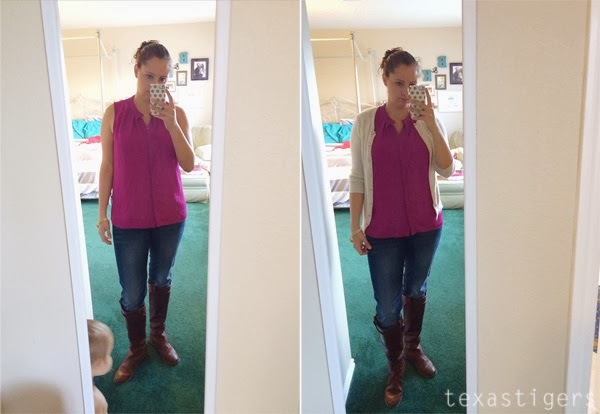 I tried one of kids clothes and it was okay but I didn't love it because I preferred to pick out what my kids wore instead of a box I didn't have control over. Then I started hearing about Stitch Fix and I decided after many months of seeing pieces I liked and would wear I decided to take the plunge and try it out. 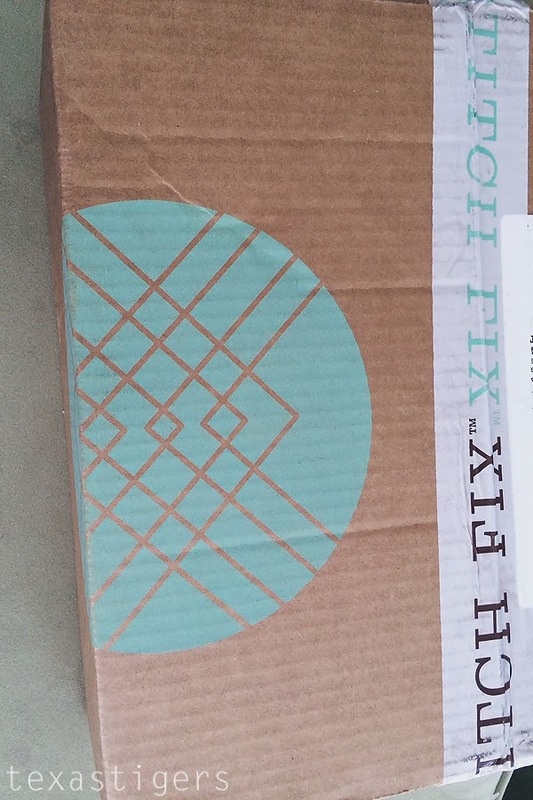 Stitch Fix isn't your 'standard' box subscription. You can choose to get a box monthly if you want but it's totally your choice. First you head over to Stitch Fix and sign up (there was a waitlist when I signed up but it didn't take too long before I got my invite) Once you are signed up, you'll fill out a style profile asking you about what you like to wear and details your stylist will want to know to style you. 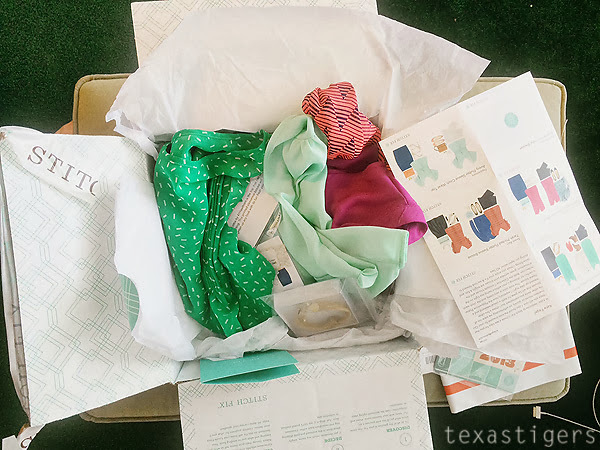 Once you've done that you can schedule your first fix and a box will come to your house with goodies to try on in the comfort of your home where you can put together outfits with things you already have along with your new pieces. You'll try them on, decided what you want to keep and send back (in the prepaid envelope) what you don't want to keep. Then you can schedule another fix whenever you want or you can say you want one monthly. 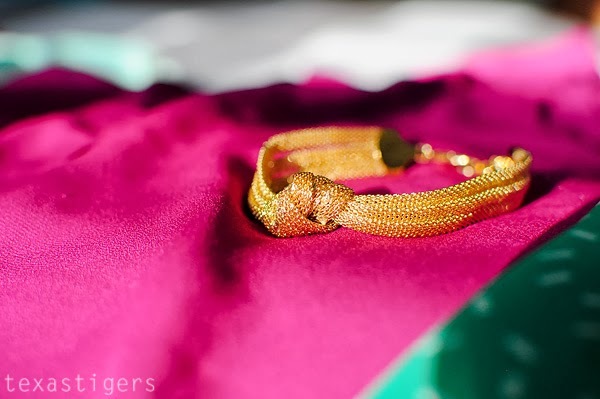 Once you decide what you want to keep you can check out online to give feedback about the pieces that were sent so your stylist will know what you like and dislike and be able to send you pieces you'll love. So after months of having signed up I finally had scheduled my fix and a day before the fedex tracking had estimated I had a box show up for me. Yay! So I took the box upstairs and opened up my very first fix. I was excited and nervous to see what the stylist had sent. I'm picky (who knew! ha!) and I requested tops in this fix but I have a hard time with finding tops that fit right across my chest at times. Notice the paper in the box up there? 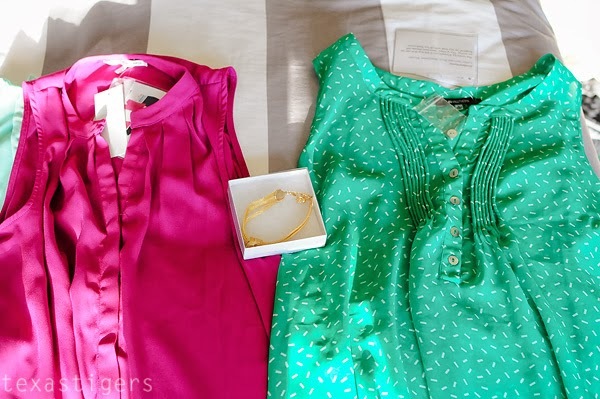 Each item comes with a tag that shows suggestions on how to style each piece and those cards were also included on the paper that had a note from my stylist on why she choose these tops for me. I love the styling suggestions - though I can see how this could be dangerous if you see an outfit idea and don't already have the other pieces to make the outfit! 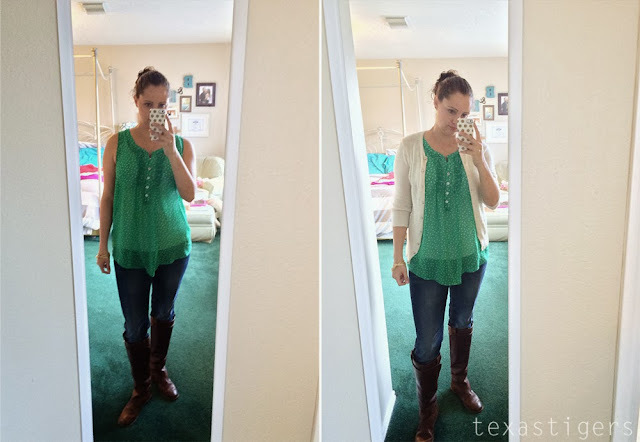 I had 4 tops and a bracelet (that I had seen on Stitch Fix's instagram and fell in love with) in this fix. I also learned from this fix that I need some serious work on selfies! Ha! So yea... I'm posting them anyway - lucky you! These first two tops I wanted to like as I liked the colors and they looked nice in the styling ideas but they just weren't great on. So these two aren't keepers for me. I liked this top. I was worried about the fact that it's a button up as those sometimes pull and gap in the button section but this one was nice. It's also a beautiful shade of purple. I wish it was a tad longer though. This one I really liked the length and flow to the body of the shirt. So between the purple (I promise it's purple even though it photographed much more pink than purple!) and the green tops I can't decide which I like better. The green feels more spring-ish to me than fall but I like the flow to it. Both of course are sleeveless but that's an easy fix with a cardigan or jacket. 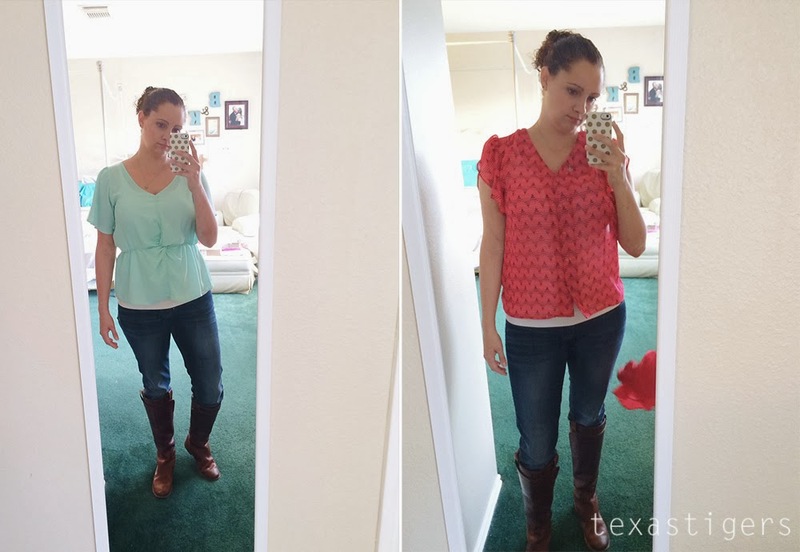 (Oh and I live in Texas where winter is about 2 seconds long and fall/spring only last two weeks) So I need help - which if any top should I keep? The bracelet I do love... even though I have tiny wrists and it's still big around my wrist with it clasped as small as it will go. I don't have any gold bracelets so I am keeping this for sure. So help me out... what would you choose? 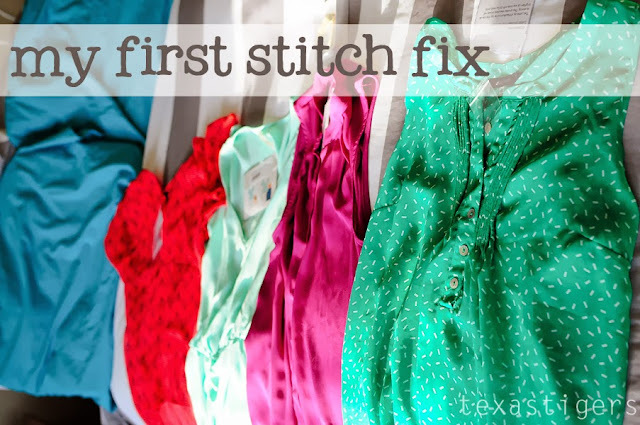 If you now want you own fix and have them style you - head on over to Stitch Fix and sign up! If you have to choose, I'd go with the green. I hope that shows up in my box soon! My favorite is the purple one!